A Coca-Cola Freestyle machine in Norris University Center, where NU Dining’s ‘Cats Cups program is available. The program aims to reduce the amount of waste from disposable cups and glasses. Students now have the option to fill reusable plastic bottles with more than 100 different beverages due to a new Northwestern Dining program that aims to increase campus sustainability. “‘Cats Cups” is an initiative designed to decrease the usage of disposable cups and glasses, NU Dining marketing director Sara Chapperon said. Students can purchase the cup with unlimited refills for $65, according to NU Dining’s website. Chapperon said the plastic bottles are available for purchase either at dining halls or on the NU Dining website. The cups are designed with Radio Frequency Identification chips that track the number of remaining fills. “These RFID chips are a very high tech way of knowing whether or not a bottle still has fills on it, and is a technology that we are planning on implementing on a further level in the future,” Chapperon said. 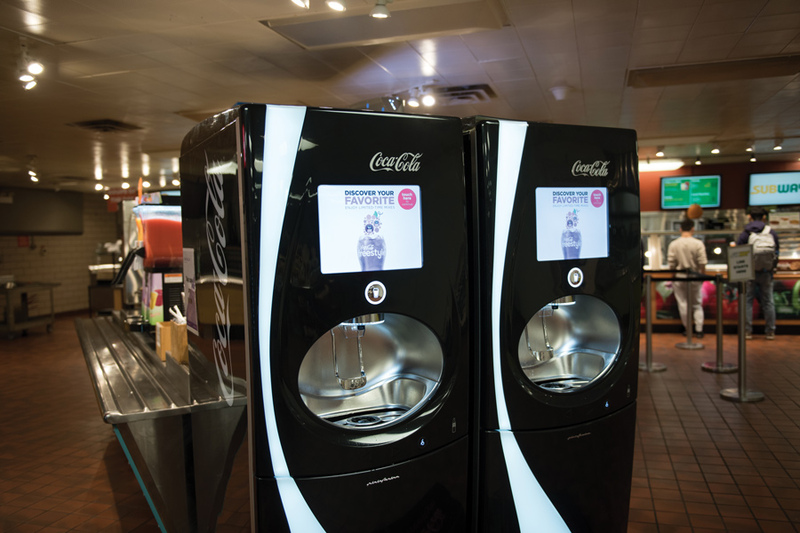 The chips work at the Coca-Cola Freestyle machines, which are controlled by touch screens and located in six locations around campus: Lisa’s Cafe, Technological Institute, Norris University Center, Elder dining hall, Sargent dining hall and the Foster-Walker Complex. As of now, the Freestyle machines can still be used without ‘Cats Cups, but in the future they will require the RFID chips to function, Chapperon said. She added that the next big step in the ‘Cats Cups program is to market it to the student body. “Our plan going forward is to dramatically increase awareness of the ‘Cats Cups on campus through advertising, so that more students will become aware of the program and see the benefits of having their own ‘Cats Cups,” she said. Associated Student Government vice president for sustainability Katie Mansur said ASG is committed to helping NU Dining and sustainNU advertise their initiatives to the student body. “ASG takes these initiatives and supports them by increasing their visibility among the student body,” Mansur said. Loren Murphy, NU Dining’s director of sustainability initiatives, said NU Dining created ‘Cats Cups to increase the level of university sustainability. NU Dining also launched “Choose to Reuse” this quarter, a program that allows students to take food from Elder dining hall with reusable containers. The programs will help achieve the University-wide goal of reducing the amount of waste sent to landfills, Murphy said. Last month, NU released its five-year sustainability plan, which seeks to increase the landfill diversion rate to 50 percent of total waste by 2020.